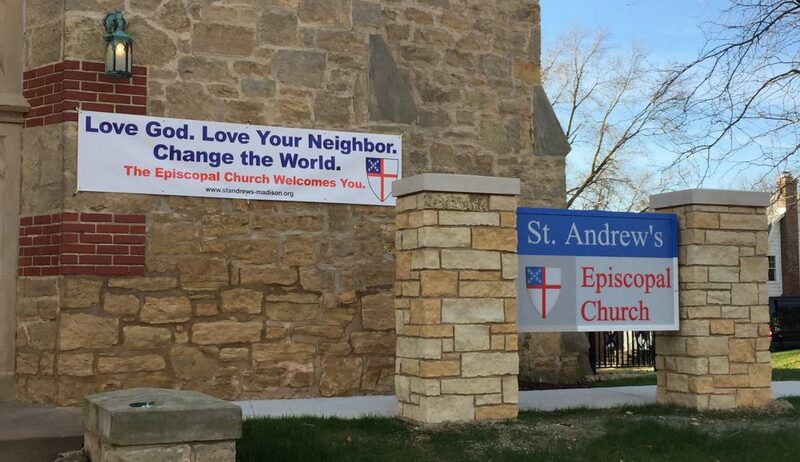 This sermon, offered on April 29, 2018 at St Andrew’s Episcopal Church in Madison Wisconsin, by the Rev. Andy Jones, is built around the readings assigned for the Fifth Sunday of Eater in Year B of the Revised Common Lectionary. May the words of my mouth, and the meditations of our hearts, be always acceptable in your sight, O Lord our strength and our Redeemer. Amen. Rituals, we all have them; whether it’s what we do with the family at Christmas time, or Thanksgiving, things that both reflect who we are and what we believe; and shape us, and who we are and what we believe. I have a little ritual that I do almost every day and I’m guessing a lot of you have the same ritual in your own context. I drive home at the end of the day. I pull into the garage. I walk back out to the curb. I get the mail out of the mailbox. On my way back in I stop at the recycling can, just outside the kitchen door, haven’t even gone in the house yet, and I start going through the mail. Ooooh! Somebody’s offering me a free dinner at Ruth’s Chris Steak House, a free vacation in the Caribbean… all I have to… oh… a timeshare…. Again and again, things that seem too good to be true… aren’t. All of these great offers that come with the catch. And so as I throw all of those things into the recycling can there are a couple of things that sort of re cycle in my head. One of which is “there are no free lunches,” and the other is “If it seems too good to be true it probably isn’t.” So I think it’s with that backdrop, that ritual that both describes who we are and what we believe, and shapes in and informs who we are and what we believe that we hear this reading from the first letter of John today. So you’ve thrown away the envelope from Ruth’s Chris steakhouse. You’ve thrown away the thing from the vacation resorts in the Caribbean. And you’re telling yourself “if it seems too good to be true it probably… How do you respond to this statement? It’s really critical, I think to, examine our response. Do we really believe that God loves us so much that God came to us, walked among us as one of us, before we could do anything to respond to that love from God. Unearned, undeserved, no interaction yet on the table for evaluation, and God already loves us. It’s really not that surprising if you look back over the biblical record. God chose Abram long before he gave Abram any rules about how to behave. Long before the Ten Commandments were handed down to Moses on Mount Sinai God chose a people as God’s own and loved them. So before we do anything, God loves us. I think that that changes everything. I don’t want to speak for everyone in this room, but I want you to just wonder for a minute, or think about, the amount of time and energy that we put into earning another person’s love, to meeting the grade, to measuring up, to doing the things that we believe we need to do in order to be worthwhile, to be seen as good, as strong and as capable, so that the people around us will value and love us. If we feel the same way about God then we are going to find ourselves driven in a way that is bound to induce fear, because there is no way we can maintain any level of excellence, or productivity, or goodness, that will earn gift God is giving us and the person life death and resurrection of Jesus, and the love that God showers upon us all the time, before we can do anything to respond. So if we can, if we can, get beyond the conditioning that there are no free lunches, and I’m sorry to any Keynesian economists in the room, if we can get beyond the conditioning that, if it seems too good to be true it must not be true, and believe that what happens in the life death and resurrection of Jesus is in fact representative of who God is and how God loves us, then we can be set free from the fear that something we might do will lose God’s love for us. Just imagine for a minute how you will walk into the world, set free from that fear, liberated, knowing, that you are loved. And then imagine for just a minute, what your presence will do for the world around you, if that’s who you are and what you believe. Because in both his letter to us, and in the gospel narrative, John tells us to abide in God as God abides in us, and to love others in the same way that God loves us. And that’s only possible if we really are willing to believe that God’s love is true. So we can go into the world and love others unconditionally, the way that God loves us, and they will find themselves being set free by the love of God expressed in our lives. If we can walk into this world loving other people the way that God loves us then the level of fear, suspicion, distrust, and resentment will go down. The trick is, I think, for us to believe and recognize that God’s love is a true gift and not something that we’ve earned. That’s why we gather here every week. Rituals both describe who we are and what we believe, and form us in who we are and what we believe, and the principal ritual for us, as Christians, is to come forward and hold out our hands, and receive a gift; something that we can’t possibly have earned, something that we can’t possibly deserve, and this very posture demonstrates our attitude towards what it is that we need… a gift. We don’t stand here waiting for our paycheck, for just compensation. We don’t stand here waiting for our due. Here in the season of Easter we do stand, but a lot of the year we kneel, and hold out our hands in deference and in awe, to receive a gift. That gift is mirrored in our love for the world. That gift comes from, springs from, God’s love for us. So as you pass the recycling can on your way out the door this morning, don’t throw this in there. It may seem like it’s too good to be true, but it is in fact God’s honest truth. This sermon, offered by The Rev. Andy Jones at Saint Andrew’s Episcopal Church in Madison, Wisconsin, on April 15, 2018, is built on the reading for Easter 3B in the Revised Common Lectionary. May the words of my mouth and the meditations of our hearts, be always acceptable in your sight, oh Lord our strength and our Redeemer. So here it is the second Sunday after Easter, mid April, happy Spring! It’s a little hard to believe. All the evidence points to the contrary. Spring isn’t here yet. And I think maybe the disciples were having similar problem this morning, or this evening, there with Jesus. Now it’s been two weeks for us. It’s really just still the day of resurrection for them. The women went to the tomb and found it was empty. Peter raced to see, came back and told the disciples what had happened. Cleopas and his companion were on the way to Emmaus and Jesus appears to them and they know him in the breaking of the bread; and now they’ve come back to the rest of the disciples… And suddenly, all in the same day, Jesus is among them. So, I just have to hear it this way, and I hope you’ll indulge me for a minute. Oh no! Wait! Wait! It’s really me! Here. Here. Go ahead, touch me. See? I’m real! Yeah, I know! But it’s me! See the wounds? Ok. Ok. What do I have to do to convince you? Hey, I know! How about if I eat something? You know… he had told them three times. He told them that this was what would happen. So, you’d think they’d be expecting him here in this moment. I have to feel like maybe he’s a little frustrated or exasperated with them. So here we are not very long after Jesus spoke these words, and the disciples see Jesus, and they just can’t believe their eyes. All of the evidence would point to the contrary. Jesus with dead. Now I guess maybe, maybe, we can cut the disciples a little slack here, and maybe in fact we should. Because the disciples, living where and when they did, new all about rejection, betrayal, mocking, and insults. They knew all about spitting, flogging, humiliation, and torture. And they knew full well that speaking truth to power, working for justice and peace among all people, and demanding the dignity and respect due to every human being… could very well get you crucified, dead, and buried. They didn’t need to be convinced that Jesus was dead. But here he was standing among them again! It took a lot of convincing for them to believe that this wasn’t the ghost or an apparition. They knew all about Good Friday, but they weren’t prepared for Easter: for Jesus standing amongst them, clear proof that death is not the end, love triumphing over hate, God still with us even after all that we have done. Nothing in their world, nothing in their experience, not even Jesus telling them that it would happen, could have prepared them for Easter. And that’s why they couldn’t see it even when it was standing right there in front of them. So, two thousand years later, after having had lots, and lots, of time to rehearse, and reaffirm, to re tell this story… I have to ask how prepared we are to see Easter. Everywhere we look the focus seems to be on rejection, betrayal, humiliation, torture, and death. The world around us and knows all about, is always trying to teach us about, seems to want to live forever… in Good Friday. That’s a dangerous thing for us because when we are constantly bombarded with Good Friday, we begin to expect Good Friday. And when Good Friday becomes normal we stop expecting, stop looking for, may even stop being able to see Easter when it’s standing right in front of us. We might even start to act as if Good Friday is the only possibility, the only way to be in this world… And the darkness threatens to overwhelm us. Now that sounds pretty awful, but I have to tell you that it gets worse! Jesus says to his disciples, and to us this morning, “You are witnesses of these things.” You are witnesses of Easter, of resurrection, of new life! Jesus is expecting us to proclaim the truth, the reality of Easter, in opposition to Good Friday, to all nations. But if we’ve stopped expecting, looking for, or even seeing, Easter in the world around us… we are going to make pretty poor witnesses. If we are going to be an Easter people, if we’re going to stand up against the narrative, the posture, the suffocating oppressive weight of Good Friday, then we have to have some Easter to which we can point. The world around us isn’t on our side. But I have to tell you that there’s good news. When our eyes start to fail us, when we can’t see, whether it things in the distance or things up close; we go to the optometrist, and they examine our eyes, and they give us a prescription for new lenses through which to see the world. We put those glasses on and we see the world, not in a new way, but in the way in which truly is. Jesus is here, all around us, all the time. God is here with us offering us new life. That’s real, that’s the way it is. We just have to be able to see it. So what we need to do, I think, is to re grind our lenses and, maybe see the world through Easter colored glasses. I’ve got a way for us practice. So here’s the deal. Today, and today only, when the baskets come around, you to take something out! In these baskets are some little notebooks and some little labels that you can affix to them that say “Easter Sightings.” There are 50 days in the season of Easter we’re two weeks in… now my math isn’t great, but we’re somewhere around thirty six, thirty eight if you’re counting Sunday, days left in the season. Fifty pages on which to write down something every day that witnesses to God’s continued presence in the world, that manifests love triumphing over hate, the tells us that new life can come out of death; a way to practice seeing Easter in a world that only wants to pay attention the Good Friday. Now if you’re really courageous you might bring these books with you to church, every Sunday between now and Pentecost, and share your sightings with the people seated next to you in the pews. Because they probably won’t have seen the same things that you have, and they’ll have new things to share with you, and I’m sure that show both need to see and hear one another’s testimony, and witness. And then, if you’re really brave, you carry this around in your pocket or your purse, it’s small enough, and when you’re somewhere else, not here, pull this little book out and thumb through it, let people see the pastel colors on the cover, and hope that they’ll ask you what’s in it. And then, you will have a chance to witness to all nations the truth of Easter: that death is not the end, that love triumphs over hate, that new life comes out of things that were old or being cast down, and that we are God’s beloved, and God will never abandon us. Jesus is here this morning saying you are witnesses of these things. This sermon, offered at Saint Andrew’s Episcopal Church in Madison, Wisconsin, on April 8, 2018, by The Rev. Andy Jones, is built on the readings for the Second Sunday of Easter in Year B of the Revised Common Lectionary. You can find hose readings here. May words of my mouth, and the meditations of our hearts be always acceptable in your sight, O Lord, our strength, and our Redeemer. Evening on that day, the first day of the week, and the disciples have gathered to try and to process, to make sense, of the events the last three days. It has been a tumultuous ride. On Thursday we gathered with Jesus and he washed our feet and gave us the gifts of bread and wine. Then we followed him out into the garden where we couldn’t seem to stay awake while he prayed. And then the soldiers came to arrest him and we fled. We deserted him and left him there alone. The next day we watched from a distance in horror as he was nailed to a tree and died. And then this morning some women from among us came to us and told us that they had seen the Lord. So we’re here now trying, trying to understand, filled with confusion, doubt, grief, and some shame. The doors are locked because we’re afraid that the same fate that befell our master, our teacher, our friend, might befall us if people recognize that we are his followers. We are afraid. The next thing he does though is harder understand. He says peace be with you and then he immediately shows them his wounds, the marks of the nails in his hands, and the wound in his side. Well, maybe he was trying to prove to them that he was the same person that had been nailed to the cross and died. Maybe was trying to show them that he was not a ghost. Still… wouldn’t his presence in the room, there with them have been enough? Again, it’s the wounds! There’s something about the wounds that seems to be awfully important here. Surely, surely, God rising from the dead would come back with trumpets and angels, and a heavenly chorus, with lights shining, cleaned up, sanitized… powerful, strong, ready to finally enact God’s agenda. But that’s not how God comes back. And there’s more going on here than the need to prove that he’s not a ghost. Jesus is once again manifesting, making real for us to see, something important about God nature. God comes among as one of us bearing our own wounds, bearing his own, claiming them, sanctifying them, making them holy. Now that may sound a little strange but think back for a minute to the beginning of this story. God doesn’t enter the world in the person of Jesus wrapped in purple cloth, in the throne room of Kings. God enters this world in the person of Jesus a vulnerable naked infant, born in poverty, in a manger in a cave. God doesn’t come into the world with a sword in one hand and lightning bolts in the other. God comes into the world vulnerable, broken, and hurting. Just like us. That’s a pretty powerful thing to ponder. It’s a great comfort to us, I think, to know that we are not alone in our pain and suffering, and that God understands them in such a profound and deeply personal way. God bears our wounds, and walks among as one of us. But there’s another aspect of this story that I think often gets overlooked in our rush play with the name Doubting Thomas. That is that this passage from John’s Gospel is the place that the Holy Spirit is given to the disciples. Now if this story about Jesus’s wounds isn’t so much about the physical appearance, the manifestation of Jesus… if the wounds aren’t there to convey that he’s not a ghost, but are there to convey something profound about God’s nature… then the way that God sends Jesus into the world, and the way that Jesus is sending us, is broken, wounded, hurting. That’s how God comes to us, and that’s how God sends us into the world. That’s really, I think, great news! How much time do we all spend trying to clean up and sanitize ourselves, trying to hide our brokenness and our woundedness? That effort leaves us defensive and afraid that we might be found out. And when we go out into the world trying to disguise, or mask, our own woundedness we are likely to show up with a sword and with lightning bolts. We’re likely to show up with all of the answers, with the textbook show others how to do it. We’re likely to show up and push our way into the center and tell everybody else what do. But it’s our vocation in the church to participate in God’s reconciling love, to reconcile all people one to another and to God through the love of Christ Jesus. And the only way to do that, is to show up, and to be willing to be vulnerable. We need to do that whether we’re working with our friends and partners at St. Paul’s AME, whether we’re serving at the soup kitchen, whether we’re working downtown to help the homeless… we need to show up in that way here… to one another. Look around this room for a moment, if you will. There are people here who are bearing the same wounds that you are. How likely are you to share your woundedness with them if they are doing everything they can to hide their own wounds? How willing are you to be in relationship about the places where you hurt and are afraid and need help if the person standing before you looks perfect, sanitized, cleaned up, all of their wounds gone, with the trumpets playing, and a fanfare going in the background? Relationship, reconciliation, is dependent upon the willingness to be vulnerable. That’s what this story is about today. It’s not so much about Thomas’s doubt. It’s about Jesus’s wounds. So, as we go out into the world to proclaim the good news of the risen Christ, we are proclaiming the good news of a Jesus who comes among us wounded, and broken, and who shares our pain, and is willing to enter into that place in our lives in a way that can heal us and make us whole. We are called to carry the words of the risen Jesus into the world. But we can’t do that unless were willing to bear our own, to let our neighbors see that we hurt too. To let the people who are afraid know that share that fear. Somewhere in the midst of that sharing we’ll find space to come together, to be one, and to be reconciled. Jesus comes among us this morning and says, peace be with you, and then he shows us his wounds, and then he says, “As the father has sent me, so I send you.